Design classics always have a number of pre-requisites to their success - a fresh or inspiring visual aesthetic, a unique brand logo or name, and an improvement or innovation in function. Think of the Nikon F SLR Camera, the Lego Brick, or more recently, the Apple iPod. 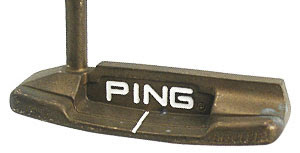 Another great example is the PING Anser putter - the most influential and copied design in golf equipment. 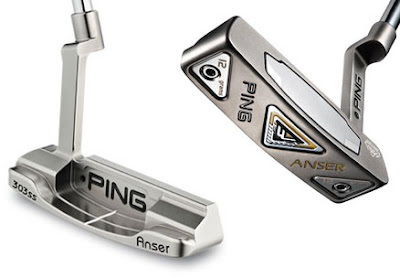 Like many great designs, the PING Anser arrived with a spark of genius at just the right time. The aformentioned pre-requisites emerged as the design was developed, and the unique naming aspects of the branding fell into place almost by accident. The inventor of the PING Anser was Karsten Solheim, an engineer at General Electrics in Phoenix, Arizona during the 1950's. During the week he was designing jet fighter components, and at the weekends he was playing golf, and struggling to hole putts. In attemtping to modify his putter, he came up with his own design - something where the shaft of the putter attached to the head in the middle, rather than at the end, thus balancing out the weight distribution. The idea was to produce a more pendulum-based, repeatable stroke, making it easier for golfers of all abilities to putt more consistently. The design had a rather industrial and ugly look to it, and featured a hollow interior and a brass head. Once the prototype was built, it made a peculiar 'ping' sound when it made contact with the golf ball, and so Solheim christened it the 'PING' putter. Despite the clunky looks, Solheim's initial tests showed that the centre-shafted balance greatly improved the functionality of the club. Solheim spent the next seven years developing his design into a commercial model. During the 1960's, the golf equipment market was dominated by established sports brands like Wilson, Spalding and MacGregor. There seemed little hope for a fledgling start-up to compete with these giants, but Solheim obviously believed in his design, and resigned from GE in 1966 to found Karsten Manufacturing, the parent company of what would become the PING brand. What happened next is the stuff of design legend. Solheim apparently sketched out an improved design on the back of an old 78 RPM record sleeve in his garage. He then ran into the kitchen and told his wife he had found 'the answer for the problems in putting', and at her suggestion, the new design was named the 'Answer'. But because that was too long to fit on the putter, in a moment of inspiration, Solheim shortened it to just 'Anser'. The brand name was born - 'PING Anser'. The new design, this time in more durable Manganese, featured a cavity-back interior for heel-toe balance, and a tiny 'slotline' gap along the sole of the face which enhanced the 'ping' sound at impact. There was also an unusual offset hosel, a slightly bowed grip, and the words PING and Anser on the heel and toe, along with a unique serial number. The machined contours, golden head, and futuristic name of the Anser was unlike anything else on the market during the 60's. It fitted in perfectly with a generation in the grip of technological revolution, sci-fi futurism, and the Space Race. Within a year, Julius Boros had won the U.S. Open with a PING Anser, and the club's critical acclaim was matched by commercial success. The 'Anser' went on to become the most popular putter in golf history. In 1984, when the original patent expired, just about every manufacturer adopted the heel-toe design, and every modern putter owes some form of debt to PING. Solheim set the benchmark for equipment engineering and testing, for entreprenurial spirit, and for sheer design brilliance. This year, PING is celebrating its 50th Anniversary. The company, now run by Solheim's son John, still continues to produce innovative golf equipment, and the brand name and its collective visual identity has become iconic in the world of sport.